Our beautifully handcrafted 3.50 oz bath bombs are a great addition to your well deserved relaxation rituals. 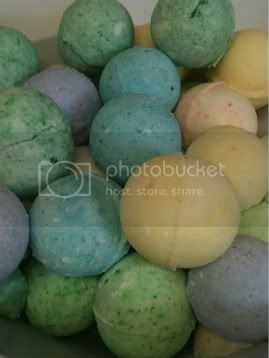 Our bath bombs are made to order. As such, each order contains (3) bath bombs. Use all three or treat your friends and family. Makes excellent stocking stuffers, teacher gifts, or an addition to an already thoughtful gift. Simply break up the bath bomb or drop the whole bomb into your bath water. As it fizzes and dissolves, it will release the beautiful fragrance and skin softening agents into the water. Ingredients: Sodium Bicarbonate, Citric Acid, Corn Starch, Epsom Salt, Sweet Almond Oil, Witch Hazel, Fragrance Oil, and colorant. Your set will consist of three spheres of the same fragrance and coloring.